William Morris Calendar – Give-Away! 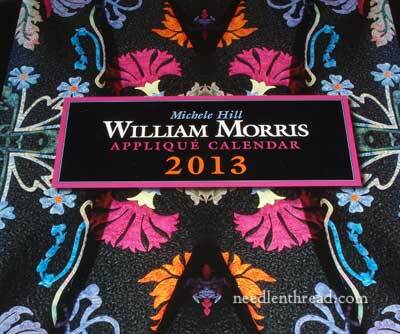 Today, thanks to Country Bumpkin, I’m giving away two 2013 William Morris Appliqué calendars. For those of you who like quilts, who like Things-Morris, who are into textiles – you’ll love this calendar decorated with beautiful pictures from the William Morris in Appliqué collection from Michele Hill’s William Morris in Appliqué books. It’s the perfect calendar to hang in your sewing area, or anywhere else for that matter! Comments are closed for this give-away! Thanks for participating! The calendar is large and colorful. It’s the kind of calendar that hangs from a hole, so that the picture is above the monthly grid. Every year, I use a hanging calendar like this to write appointments on it, check dates, and keep a clear, easy-to-find log of upcoming events, birthdays, and the like within reach. I can’t imagine living without a calendar of some sort, and it’s always a kind of ritual, finding just the right calendar to see me through the upcoming year. The William Morris Calendar for 2013 definitely fulfills all the requirements that I look for in a calendar. I like a calendar that’s appealing to the eye, colorful, that induces daydreams, inspires me, or makes me laugh. There has to be something about the yearly calendar that speaks to me – after all, I have to live with it for 12 months! Of course, the quilts and finished projects in this calendar are more than just appealing! I want them all! I want them hanging on my walls, covering my beds, folded on the sofa…. … but since it isn’t likely that this particular wish will ever come true, I will revel, instead, in the gorgeous photography that graces this calendar! And there’s enough space on each monthly grid to make appointment notes, to mark birthdays and special events, and so forth. The William Morris Appliqué calendar will make a perfect gift for yourself, for your sewing or quilting friends, for you needlework buddy or fellow guild members! And today, you have the opportunity to win one of two that I’m giving away. 1. Leave a comment below on today’s article (the one you’re reading right now). Please do not reply via e-mail or leave your comment on another article! If you could have any needlework technique featured over 12 months in a calendar, what would that technique be? 3. In your comment (either on the “name” line or within the comment box), please leave a recognizable name. If you’re name happens to be Mary, for example, please make it different from other Marys out there somehow. For example, Mary in Tuscaloosa…. Mary Mary Quite Contrary…. you get the idea! 4. The give-away ends Monday, October 22, at 5:00 am CDT (Kansas, USA). Check back on Monday to see if you’ve won. I’ll announce two winners Monday morning, and they will need to contact me with their mailing address. So, go to it! Leave a comment below, and join in the fun! October 22, 2012 William Morris Calendar – Give-Away Winners! I would love to have a calender on embrodiery. You never cease to amaze me with your features. This calendar is gorgeous – and inspiring. Thank you for introducing it to all of us. Also, thank you for the chance to win one. If I could have one theme for a calendar I would like to see machine embroidery combined with hand embroidery embellishments with beautiful threads and gorgeous colors. Maybe each month could have the colors associated with that month. What a feast that would be!! I would love to see you feature some instructions in future posts about hand applique – some of your secret tips and pointers. The William Morris calendar reminded me of an unfinished quilted wall hanging that has some detailed hand applique. Maybe your instruction could help me bring it out and finish it! My daughter and I visited the Victoria & Albert Museum in London and admired William Morris’ work in various forms. Such classic designs! I would love to have hand embroidery featured! Doing beautiful things with simple stitches. Love applique and embroidery! I haven’t seen this calendar..looks wonderful! Wow, what a beautiful piece of eye candy! I love Morris prints and this would be a way to enjoy them every day! If I could have any calendar of any needlework technique hanging on my wall, what I would love to look at everyday would be my aunt’s appliqué quilts she’s made over her lifetime. She has such talent and I have only gotten to see a few of her quilts. So I am not sure if this was what you wanted as a response exactly, but that is what I would choose if I could. Too bad she didn’t photograph her many quilts as she made them. Who knows where they ended up through the years. I would love a calendar filled with hardanger designs. Thanks for the chance to win this beautiful calandar! Hello Mary! I am so excited and hope I get one of those lovely calendars, it would be perfect for my new sewing room!! I would love to have a calendar featuring the needlework in a more modern crazy quilting. I think the pictures would be amazing and it would show so many fun aspects of stitching. It would be neat to see examples in different types of thread as well. Oh the possibilities!!! I would like all handembroidery. But the most I like cross stitching. Because that will be allways the most perfect stitchery. Having only recently discovered you and your wonderful site, I eagerly await my daily mail to delight in your inspirational ramblings and beautifuly descriptive text and photographs. The calandar looks amazing, I often stand and admire the William Morris exhibits in the museum. Be great to have a small section on my wall !! I really really enjoy your emails. I just discovered you two weeks ago so am not as knowledgeable as most might be. I am hoping to learn from you how best to determine WHAT stitch makes the most sense when you are designing an embroidery. I tend to use the same ones over and over and never make a “knowledgeable” decision — just tend to redo. I have already learned a new way to do a stitch from you and avidly look forward to your emails. Keep up the good work. PS — I absolutely love William. Have 2 books on him. what a wonderful website you have created. I would love to see stumpwork featured as I am currently learning this amazing style. I decorate my home. Thank you for this post. I would love to see a calendar featuring Russian pearl embroidery. I love it but can’t find any books. I have read your articles and much enjoyed them. I have also read the article in Classic Inspirations on pearl embroidery. I wish I could do a course on it, as I love pearls and wear pearls every day. The technique I would like to see in a calendar would be the simple Chain Stitch (with its variations added in here and there). Each month would have a scene for that month. I could go on about it but that’s it. Thanks, Paula Magnani-Smith. I believe a calendar showng embroidered stitches embellishing and supporting quilted projects would be tantalizing – just enough inspiration – to take my imagination and skill building thru each of the seasons. Looking at this calendar – it is surprising how just the right embellishment polishes up the whole piece and adds depth and richness. Actually it makes me dream of my own projects. Would love a calendar – it has been quite a few years since I have found just the right calendar. Morris prints are fantastic. One of my favourite sources for inspiration. If I could choose, I’d have Elizabethan Embroidery for a calendar. I would love a calendar that featured contemporary needlework design….the mixing of various techniques in a unexpected way. What else; embroidery of course! I’m not even particular, it could be a free form or counted. Perhaps a spot motif sampler with directions for 12 fun stitches. And then make it a bakers dozen; maybe an alphabet. 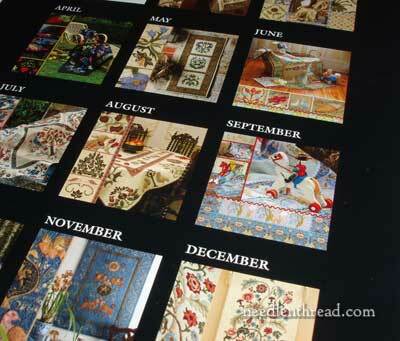 I’ve seen a lot of calendars over the years and can remember lots of quilt ones but only one embroidery calendar. If I could have any needlework technique featured over 12 months in a calendar,that technique would be applique! I have been fascinated by all the embroidery work you have featured in your newsletter so I think a year of different stitches would be fabulous!!! It could be a reminder to practice that particular stitch all month—then I could probably master it. I would like to see Jacobean embroidery featured in a calendar. Thanks Mary for giving us the opportunity to own such a nice calendar. I love what little you have shown us and hope I win. I would go for a calendar that featured pieces of Elizabethan embroidery — it is so inspiring and wonderful and intricate. One could easily look at it for the entire year. Although I am a big fan of William Morris and am currently working on a needlepoint version of his Owl tapestry. I would love to see smocking and heirloom sewing featured in a calendar!! I would like to have a calendar of Brazilian Embroidery. It is three dimentional embroidery with Z twist threads of colorful rayon threads. Not many people know about Brazilian embroidery and when people see it they are amazed at the beauty. It looks complicated to do but it really it is not. It is a matter of knowing how to do the stitches and they are easy to learn. A calendar would let people see the beauty and become aware of just what this embroidery looks like. hi what a lovely calendar! Thanks for the chance to win it. I’d love to see goldwork or crewel in such a calendar. I would like to see needle/thread painting techniques all year long. I am a novice, so I have everything to learn. But the needle painting is my favorite. So I guess that would be long and short stitch, satin stitch and any choice of outline. The calendar looks beautiful. I would love to see the pictures each month. Raised Embroidery! Can’t get enough of that! Thanks for the drawing Mary…and Country Bumpkin! I think stumpwork would be fascinating. I would love to have a calendar of antique crazy quilts! Well I would like to see the best of two worlds embroidered quilts. I love William Morris designs. Beth Russell in the UK does some amazing William Morris designs for needle point. I would love to see a calendar dedicated to crazy quilting. The antique crazy quilts I’ve seen are so amazing in the amount and variety of embroidery that has been added as embellishment. Each quilt is like an encyclopedia of stitches and colors. Hi Mary, I’m glad to be back on your website and hand stitching again. Morris was a master of design. I love his patterns and the fabrics are beautiful. I would like to see a crazy quilt calendar. Your ideas are so inspiring…now to carve out the time from my other quilting, needlepointing and cross stitching projects!!! Seeing this calendar inspires me to hunt for a quilt design using my Morris prints in my stash. Oh, I love all things “William Morris”!! 12 months of a particular technique?? I think I would enjoy goldwork — as there are SO many ways that this can be done. Or maybe stumpwork? From “historic” to contemporary. Or sumptuous,juicy whitework with padded satins stitches and various lacy filling stitches in pulled or drawn thread work. Any one would do!! Mary, how to pick JUST one! When the love of stitching runs along many different styles…the choices, the choices. Okay, probably drawn thread/white work. That includes many of my loves all rolled into one. I think a variety of embroidery types would be interesting… something different every month! But if you force me to choose just one I’d pick silk ribbon embroidery. Cloth dolls, especially the artist’s type. The disciplines used are widely varied, and wildly varied! They can be Plain Janes and very effectively finished, even to the love knot on her pinny and secret love letter in the pocket. Or Madam Hoohaah kickin’ up her purple heels, and lavish in embellishments and fun. Gracious Gertrude has a twinkle in her eye and gorgeous embroidery on her gown, albeit, with hints of, umm…desires tucked in here and there! I suppose my calendar would be covering a number of techniques but there you have it. And I want William Morris’ too. Love it. One of my doll’s would need to have a quilted skirt or wrap, set off by tiny embroidered somethings and beaded fringes. Thank you Country Bumpkin and Mary for this fun giveaway. It’s a really good question Mary. I can’t choose just one needlework technique to be featured all year in a calendar. If each month featured hand needlework with beautiful fibers and fabrics, I’d be loving it. Thanks for the opportunity to win this beautiful calendar! I just returned from a week in London and went to the William Morris Museum – I would LOVE to win this calender as I’m a quilter as well as an embroiderer! My favorite technique would be crewel – I brought back several kits from Philippa Turnbull’s booth at the Knitting & Stitching show at Alexandra Palace – love it! As an artist, an embroiderer and an applique quilter, I have always found William Morris a constant inspiration. His work delights my eye as well as my heart. Michele Hill has truly captured the look and spirit of his work in her applique. As you say, a calendar of her work month to month is something delightful for the studio wall for an entire year. and after the year is up, something this beautiful gets filed away as a mini art book to inspire for further years to come. Thanks so very much for introducing this wonderful quilt artist. I would like to see a calendar of hardanger but the Morris calendar is lovely. I am a life-long quilter venturing now into the realms embroidery. I would love a calendar featuring new twists on traditional quilts. Quilts have been a part of all our heritages based in need yet personalised in one of the few ways woman could express their artistic drives. (Think of the quilters of Gees Bend) Today these traditions are being kept alive by fibre artists who stretch us with their imagination. Their use of colour, fabrics and embellishments would inspire all handworkers – and at the end of the year imagine all those pages framed! DELICIOUS don’t you think? A calendar of Stumpwork embroidery images would be interesting. The 3 dimensional look to the work would lend itself to lots of interesting photography and setup options. Also rug hooking…lots of beautiful William Morris designs in rug hooking. I love, love, love William Morris! I cannot chose just one…I would love to have the Morris calendar because it speaks to me on both the techniques I would love featured. I am torn between applique and hand embroidery. I can see how they work together and the inspiration from one to the other…Areas like flowers could be appliqued and details added with embroidery like a bee or ladybug or the same design might be all embroidery with satin stitch or other stitch to fill in the larger area. William Morris — one of my favorites. What a fabulous give away! I enjoy your crewelwork and various analysis of stitches. I don’t do much of this type of embroidery, thus I have gained much knowledge. Thank you. I would love a William Morris calendar. Thank you for the chance at one. If I had a choice for calendar photos I would pick stumpwork. It’s a technique I have been exploring lately and I would enjoy the inspiration. I would ADORE having a calendar of pulled and drawn needlework. The stunning variety that can be achieved simply by pulling tight using a relatively small selection of stitches is simply jaw-droppingly inspirational to me. But for now, my admiration for all things William Morris approaches reverence! I think a calendar of crewelwork designs would be wonderful to look at and provide lots of inspiration. This calendar is beautiful! I seldom see anything on needlework of any kind on a calendar. I would love to see some on vintage lace/linens with beading. If I have a calendar that is particularly appealing, I use it after the year is over: i.e. making envelopes, framing, greeting cards, holiday ornaments and any number of things. Thanks! I enjoy your articles every day. Please keep it up. I would like to see an article on “stump work” along with a little history. i really like william morris so a calendar based on his themes is already going to be a fav for me. i also think jacobean work would make a good calendar cos it’s cheerful. What a beautiful calendar. I could definately look at it for 12 months. If I could choose a form of needlework for a calendar, it would be drawn thread work and hemstitching. I have seen examples on vintage handkerchiefs that look just like lace. If I could have any needlework technique on a 12 month calendar, it would have to be zardozi, Im obsessed with it right now and am experimenting with it. It might be a bit too heavy for a calendar but in my magical world of wendy land it would work haha… Thanks Mary!!!!! I would love to see his work daily. His designs are beautiful and timeless. What a beautiful calendar…I just love it! A year full of Hardanger embroidery would be my idea of a neat calendar…and there are lots of items which could be included. Thanks again for a great giveaway. An entire calendar in Madeira applique would be delightful! There are so many possibilities from sweet baby gifts to lovely home furnishings. Oooooooo, please, please, pleeeeeeze? I am still working on my wall quilt, and am using embroidery (both hand and machine) and have been thinking already about my next wall quilt. On my next one, I’d like to mix applique and embroidery. This looks so inspiring! Thanks for all you show us! I’d love to see have a calendar featuring goldwork. I’d like to be entered into the drawing for the Richard Morris Applique calendar, please. 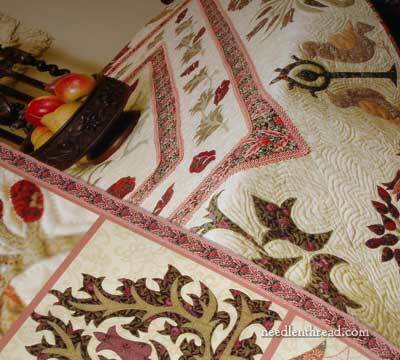 I love to applique, I back-baste and needleturn in all of my spare moments. I’d love a calendar of applique that fills a whole year of months full of pictures and colorful eye-candy, with a Morris theme. That would be a great inspiration to appreciate and stare wistfully at while keeping track of important dates, lest they slip by. This is beautiful. I would love to see a calendar that pictures the process of tatting. This calendar is so gorgeous and inspirational. I think just a beautiful picture for every month of the year with a different technique highlighted for every month would be fantastic. Like you, I place high value on my calendars! This one looks beautiful. I would love to have a calendar with a different embroidery technique each month, but your question asks that we choose one, so I think I would love to have a calendar featuring blackwork every month. It’s one of my favorites and I don’t think I’ve ever seen it featured in a calendar. What a beautiful calendar! I would love to learn more about combining embroidery and quilting! Love the photos of course and with 4 grandchildren and an elderly mom to care for, the large boxes are a must to keep track of my wild and crazy life. If I could have a calendar made, I would love to see one with photos and information about advanced embroidery and cross stitch stitching. Something beautiful to see and challenging to try. Heééééé…..l graag ontvang ik de kalender. Dat is mijn grote wens,om daarvan kennis te nemen en inspiraie op te doen. Dank u wel Groeten van Riet. I would like to see a calendar that features embrodiery techniques from around the world especially those of Europe and Scandinavia that I don’t get to see in my neck of the woods. Love your blog. It is an inspiration to me every time I read it!! Another winner from Country Bumpkin! The William Morris Calendar looks to be colorful, crisp, and warm. If I could design a calendar for 12 months, I would love to see “smalls”. That is my passion, I cross stitch or needlepoint small items and display them in my china cabinet. I follow some blogs that truly inspire me and have made many gifts for my stitching friends. I would love to have this calendar hanging in my office, so that when the day gets tough, I can look up and smile. I love wool applique work and would love to have it featured. The needlework technique I would love to see featured in a calendar would be quilting. The mix of fabrics, colors and stitch patterns is comforting to my eye. I dream of being able to actually complete one of these quilts some day. Embroidery, both modern and ancient. I’d love a calendar like that. In answer to the question of what I wish to see more of, it would be more needleweaving embedded in an embroidery design, similar to what has been posted lately on Mary Corbet’s Needle ‘n Thread website. I am also a fan of a simple cross stitch. I would to see more of that. Mary thank you for allowing us to win this beautiful calendar.It is perfect. William Morris has created wonderful drawings. Photographed quilts are superb. This is just to dream every month of the year. I know I can never embroider all these poetic quilts. What a gorgeous calendar! But why choose only one technique? I could find space to hang several calendars if they were as interesting and attractive as this one. One would be counted cross stitch, maybe a surface embroidery, quilting, of course, hardanger, crazy quilts–it’s just to hard to choose. but cross stitch and quilts for sure! Traditional needlework techniqies have my heart & soul. I am drawn to samplers, tapestries, lace work, ethnnic embroidery, drawn-thread work like Hardanger, crazy quilts, embroidery on old quilts, curtains, & clothing. Appreciating history also means appreciating how beautiful, long-lasting works were created with very little tools & techniques we have for use today. William Morris also appreciated traditional colors and techniques, while incorporating those concepts into his contemporary designs. I think my favorite techniques are the redwork or blackwork or even an entire calendar of pieces of historial embroidery on tapestries and quilts. Thank you for always teaching and exploring this amazing art. Mary, what a wonderful calendar! My 2012 calendar featured crazy quilts by Pat Winter and I love it (it’s a keeper even after the year is over, just for the inspiration it brings). So I suppose that’s my answer regarding what stitches I’d like to see on a calendar. The William Morris designs run a close second! I love reading your blog every day. Thank you for doing it. I guess I would choose crewel embroidery. Lots of other techniques would be nice too. I would love to see Hardanger featured. It is one needlework art I’ve always wanted to do. I do love quilting too so would love to have a William Morris calendar. What a beautiful calendar. I love the pictures and it will look so nice on my cube wall. Of course, then I can take it home and make all the quilts. It’s a double blessing. Mary, what a lovely give away. I enjoy stitching antique sampler reproductions. It would be lovely to have a calendar that showed representive antique samplers from various parts of the world. This would be proudly displayed in my home. Thanks for a chance to win the William Morris calendar. For once I am actually NOT entering one of your spectacular give-aways! Why? Because I own the William Morris applique quilt books, and I have promised myself that one day I will make at least one block from one of these remarkably beautiful books. The calendar would look stunning on my wall, but I want someone else to have that opportunity – preferably someone who is learning about William Morris for the first time. But maybe I’ll buy one for myself . . . hmmmm!!! Wat zou ik graag deze kalender willen winnen, hij is echt te gek. Een borduurkalender van William Morris is altijd mooi om te hebben. I’d pick different kinds of embroidery for every month, because how could I choose just one? I’ve been a quilter for a long time, though, and would love one of these calendars. The very idea of appliqueing William Morris designs blows me away! I personally would like a different technique featured every month. I love all kinds of needlework. My calendar, gold work I think. The difficulty would be in choosing between traditional and modern, since I find both facinating. I do love quilts though. Thanks for another great give-away opportunity Mary! My favorite needlework technique is Crazy Patch because there are no rules & anything, including the kitchen sink, may be incorporated. My 2001 copy of Piecemakers Times & Seasons Calendar & Quilt Book is nearly threadbare, but remains an inspiration. In that calendar, all the instructions for creating the patches & blocks were included. As to the William Morris applique calendar, it would make a nice companion for my copy of “Arts & Crafts Needlepoint”, a book given to me by a friend. Such elegant designs, curvy motifs & rich colors! BTW–personalized custom calendars are so readily available, we could each own the Embroidery Calendar of Our Dreams. Big-box office supply stores & online services create them with customer-submitted photos. Hmmmm, maybe an EGA chapter project?? This calendar makes me want to take up quilting for a hobby. Love your emails and your embroidery! Thanks for the opportunity to win such a lovely calendar. I would like a calendar with embroidery patterns and samples. Embroidery! I adore it! Especially Arts and Crafts Movement, and 18th century English, Continental and American. And speaking of William Morris, he really rejuvenated the medium in the 19th , drawing on Persian, Oriental, medieval and renaissance motifs to produce his iconic needlework as well as textiles and wallpaper. It’s amazing, isn’t it, how he continues to influence needleworkers and other artists over a hundred years later! I love redwork or any embroidery of one color. A beautiful quilt calender would be far superior to the one the local bank gives out. Thank you for this opportunity. I would love to see a calendar dedicated to interestingly stitched hand painted canvases. A calender of embroidery is a lovely idea. 2013 is the 40th anniversary of the Embroidery Association of Canada. They have several projects available as Fundraisers. One of them is a Calender. The calender sells for $25.00 Canadian and comes with a CD of the patterns for each of the 12 designs which are various embroidery techniques. I am currently working on “Frost” and plan to do most of the projects. I think a small project each month in a different technique is a way to encourage others to try something different. I certainly will buy another calender like this. Even tho I’m crazy about cross-stitch, I would probably prefer crewel embroidery for a calendar. I love the different stitches, the different textures one can make, and just how lovely it all looks when finished. I would have to say Crazy Qiulting. I would love to really linger over that inspiration the whole month through. Thanks for another wonderful chance at winning! Beautifful calendars! If I could choose a technque to be displayed over twelve months I would choose surface embroidery, preferably done with cotton floss or perle cotton. Applique, applique, applique! I love William Morris and am always attracted to fabrics based on his designs. 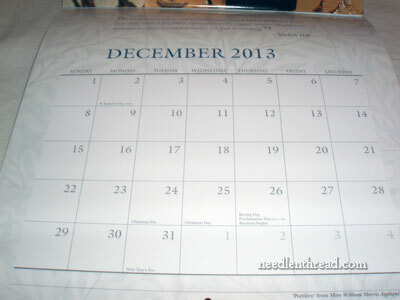 Thanks for the chance to win this calendar and for informing your readers of its availablity. as an ambroiderer and a quilter I find your features very inspiring and helpful. thank you for sharing you vast knowledge with us. I would like to have a calender with traditional Baltimore album quilt patterns. my second choise would be crewel embroidery. As an avid quilter, I been following the revival of William Morris…from wallpapers to textiles…what a journey! Of course…quilt books!!!! Recently, I have been adding embroidery to my quilts …so this blog is on my daily reading list! The “How too” Videos are my bible of stitches!!!! Thanks for sharing the new calendar!!! The 22nd is my Birthday…great present! Hi Mary! I would like to see a calendar of crewel work, especially antique crewel. I love the flower and animal combos that are often featured in crewel. and I join the fun! Yum! What gorgeous colors, too! I think needle-painting would be fascinating to see as well as varieties of folk stitching. I learn so much from this blog-the Hungarian stitching post the other day was really neat. Just a few stitches, but oh! the outcome is so beautiful. If there were one needlework technique that I had to restrict myself to for a year, it would probably be crazyquilting – just because so many needlework techniques are used….embroidery, needlelace, applique….that would keep me inspired! And the William Morris needlework that Michele Hill produces is so amazing! Please pick me! I’m a real William Morris fan. That’s a calendar I’d love to have. I love crazy quilting too, and would like to see a calendar with crazy quilted blocks. Or maybe thread painting. Or gold work. Or crewel work. Or. . . Hard to pick a favorite. Thank you (& Country Bumpkin) for being so generous. What a lovely calendar. I would love to find a calendar with stumpwork or even flat surface or goldwork embroidery. I’ve never seen calendars with those techniques spotlighted. Thank you again for sharing your talents. I look forward to the daily newsletters. Love the pictures. Wish it was mine. Quilts are always so lovely to look at. My favourite needlework technique is invisible applique – and although some people wonder ‘why go to all that effort when no one can see it to appreciate the work that was involved… ‘ … “I” will know what stitches are hidden! William Morris designs are truly timeless. I would love to win this beautiful calendar full of wonderful and inspiring applique ideas! If you are asking what other technique would be great over a 12 month calendar – I might suggest Mountmellick Embroidery… ! I would love to see chicken scratch embroidery displayed over a 12 month calendar! Thanks so much for sharing so many different things related to a love of needlework. Like you, I find that this calendar seems to cover my desires of color, interest and dreaminess. I find beautiful needlework very inspiring creatively. To be surrounded by beauty is a worthy goal as Mr. Morris said himself. And the details of life should be beautiful as well. Why not? I would be interested in seeing stump work featured in a calendar, because it looks so complicated and fascinating. I would love to learn how to elevate my needlework skills. Thanks again for your posts full of actual information as opposed to the infinity of blogs and sites just full of pretty pictures and fluff. The technique I would choose is Jacobean crewl work. I like doing it myself but also think there are such lovely colours and designs. If I had a calendar to publish I would choose surface embroidery. Most likely Jacobian designs, I am also a fan of the William Morris (my Uncle’s name) designs as they seem similar to me; large flowers, shapes and beautiful colours. Aargh!!! I forgot to follow the guidelines and say what kind of needlework I’d like to see featured, sorry! I love stumpwork, and would love to see contemporary stumpwork featuring natural, realistic things. Thanks again! The technique I would love to see would be crazy quilt blocks. The stitches can be so creative with such an assortment of threads, yarns, ribbons. The possibilities are endless and oh so beautiful! The needlework that I would put into a calendar would have include different types because I love doing different things. I would include at leasst one of each of the following: goldwork, blackwork, thread painting,crosstitch,hardanger,crewel,stumpwork,schwaln embroidery, and bead embroidery. It’s just exciting to create using different methods and different threads. Awwww the threads. Only ONE technique? Help me. How about a different technique each month? Black work Embroidery, Crochet, Stump work, Knitting, Quilt Piecing, Smocking, Tatting, Applique Quilting, Gold Embroidery, Bobbin Lace, Spinning, Ecclesiastical Embroidery. Oh what a great give away! I would like to have every month feature a different style of needlework. My favorite is still cross stitch but I like to see other embroidery added to cross stitch projects. Gives me a challenge and expands my stitching. I love your site it is my constant source for embroidery ideas, explanations and inspirations. It was very difficult for me to pick a single technique for a calender. But I would have to choose Or Nue. The delicate gold field being shaded by silk thread to create a beautiful, glittering tapestry. It will be a long time before I even consider attempting Or Nue. But I can appreciate the work, skill and the spectacular results. But Mary, couldn’t you have a calender? I mean this quite seriously, a calender with highlights of certain stitches, projects. A calender would be great that focused on various past projects until you got things caught up –well more or less– possibly adding guests as well. Its an idea and I would love BOTH calenders. I’ve bought your booklets and enjoy them. I also would pay for both calenders. This calendar looks beautiful. I actually love hand applique. I have been trying to perfect my techniques and just finished a quilt with hand appliqued flowers. This calendar would be a great inspiration to complete more and would love to look at the quilts each month. Thanks for all your instructional embroidery information. What a wonderful calendar. I have the perfect person I could gift that to! I would love to see darning techniques featured or stump work. I’m wanting to do them in the future but have feared the challenge. Thank you. I would love to have a calendar with a variety of emboidery techniques. A William Morris one would be lovely as I love that style and I love quilts and applique. Easy answer for me. I would like a colorful calendar of any type of surface embroidery. This calendar is wonderful. If I had a choice of a topic for a calendar it would be Hardanger and Cutwork stitches and designs. I’d love to have a calendar with photos of ecclesiastical embroidery with a larger photo of the piece and smaller pictures of details around the edges. I’d love to see applique work and embroidery accents featured in a calendar. This calendar looks absolutely beautiful and would look lovely on my sewing room wall. I like you search each year for the right calendar to inspire me and to keep track of my appointments. I also use it to track my quilting and embroidery goals. I love this calendar because I am a quilter who has recently fallen in love with appliqué. As to what kind of needlework I would like to seein a calendar, it would be 12 months of goldwork . You introduced me to this beautiful art and I just can’t get enough of it. Thanks for your daily inspiration. Thanks for the opportunity to win this gorgeous calendar. Wouldn’t it be nice to have a calendar featuring beautiful lace making techniques from around the world? I would love to see picures of laces and a little about the technique’s country of origin, history, etc. Many thanks for sharing the link for my very favorite applique style. Absolutely love your daily newsletter! I so appriciate your instructions on the different stitches as they are easy to follow. I am the “old fashion” type that appreciates the unique talent of hand work. From my German roots of hand embroidery for the royalty, to today, our family has contimued to keep this art alive. Seeing others work, albeit per calendar, would be a special thrill. Thank you for this opportunity to try for one of these free calendars. I am an adamant admirer of William Morris designs and have made one of the quilts in the first book, and would like to make many more. ( life just isn’t, long enough). My passion is making hand appliqued quilts embellished with hand embroidery. This then would be my delight to have a years worth of embroidery designs that would coordinate with and decorate and enhance appliqued flowers and leaves and fruit and trees and birds,and other motifs. If I could have any technique it would be embroidery. Trish Burr comes to mind as do all the beautiful things in Inspirations Magazine. I am drooling thinking about it. Thank you for the chance to win one of these wonderful calenders! I would thoroughly enjoy a calender featuring Brazilian Embroidery. I would love to see and learn more about stumpwork, to me, it makes embroidery “come alive “. Oh, but then applique designs in calendar form –so many options! Thank you Mary for your newsletter it’s become an important part of my day. Without a doubt, ecclesiastical embroidery. I can never get enough. If it were a calendar of the ecclesiastical embroidery of Pugin, Morris, Comper, Tapper or any of the Gothic revival greats, words could not describe such a feast for the eyes! Well, I want a new technique – weaving plus embroidery. I recently aquired an old weaving loom. I am thinking about an embroidery tecnique both on the loom and using weaving lace. Woven lace is an old weaving idea, but should there be a way to add embroidery while you weave?? I intend to figure something out..has anyone tried this?? If so, I would love to see an article on it!! I would love to have pulled thread work featured over a year with a different stitch for each month thereby making a sample of memories. What a beautiful calendar! Then again, I’m partial to William Morris. I’m not sure my applique skills are up to duplicating the designs in the calendar, but I’d love to have them hanging on my wall all year. If I could have any needlework technique featured over 12 months in a calendar, I would choose blackwork. I find it fascinating how many different effects can be made with just straight stitches and one color of thread. A lovely calendar would share with needleworkers the beauty of Brazilian Embroidery. This type of emboidery has drawn many creative designers who fashion dimensional flowers, animals, and other creations with needles and rayon floss. It has also drawn many embroiderers who love this art. There is a joy within this group which it would like to share with the rest of the needlework world. I think the needlework technique I would like to see in a calendar is not a particulat technique, but different types of historic needlework. I am fond of Elizabethan embroidery and would love to learn more on a monthly basis. Also, I have loved William Morris since I became enraptures with the Pre-Raphaelites! I would love to see a gold work calendar, especially ecclesiastical! I would like to see Needlepoint (canvas work) featured. I really enjoy seeing all types if needlework and get ideas on how to use them on Canvas. I would love to see embroidered stumpwork featured on a calendar over the 2013 calendar year. What a beautiful calendar!! I’m primarily a quilter so I usually find a quilting calendar that speaks to me. If there is extra embroidery or other embellishment on the quilts so much the better!! Thank you for this giveaway – this calendar would be so inspiring!! I would love a full year of Whitework lessons. Like a block of the month. Then at the end of the year I would have 12 beautiful blocks. Thank you for the opportunity to win a beautiful William and Morris calendar! I would love to have a calendar with beautiful hand embroidered (using different stitches and threads) and appliqued small projects. A bonus feature would patterns and instructions on completing the projects. I recently signed up for your newsletter and am so excited to receive your daily postings. I would like a calendar that would feature a different kind of embroidery each month with a gorgeous picture illustrating the work. One month would have Mountmellic, another would feature jacobean crewel work, redwork or hardanger. I love anything worked with a needle! I have started a quilt using patterns that are inspired by William Morris so would love to have the calendar. Needlework technique? Hum! I have started to do some needlepoint. I would like a decorative needlepoint-only stitch shown each month. Step-by-step instructions across the bottom and, maybe one side, with a closeup of the finished stitch from top and side, and the largest picture being the whole project finished. I have admired William Morris designs for many, many years. This is the type of calendar I use. Thanks for offering two of these. Can I win one? Please? William Morris designs are amazing. But I would love to see a claendar with Stumpwork and Bralizian needlework. I saw a photo of a Begonia plant that was actually stumpwork. It was amazing and I was hooked on stumpwork. I would love to see a calender of counted thread techniques. Cross stitch or any of the specialty stitches,pulled or drawn thread,hardanger. Samplers show these skills nicely. I can just picture some beautiful work! I adore William Morris’ designs. A visit to the V&A left me with my mouth open in awe. His signs thrill me and I would adore to look at them each month of next year! I admired William Morris designs even before I knew what they were. It is terrific to have such a pantheon of applique work inspired by his esthetic as a year-long treat. They are illustrations that will go into my inspiration notebook. The textiles embroidered and embellished by the women of Belgium and sent to relief organizations, companies and individuals as a token of thanks for food and support from the USA are a reminder of the generosity of our people during WW I. They are gorgeously and imaginatively decorated and inscribed with messages of gratitude. If I could have any needlework technique featured over 12 months in a calendar, I would choose silk ribbon embroidery. The calendar looks gorgeous. I would love to see a calendar full of silk shading. 12 months of goldwork would be awesome! If I was lucky enough to win one of the William Morris calendars I would give it to my friend Rachel as she adores William Morris materials and is a quilter/patch worker. Hi Mary, This calender is 12 months of inspiration to hang on my wall 🙂 I would also love a collection of anything stumpwork,I love it all. Thank you Mary for your daily givings. I was inspired by the pictures of the calendar. My mother made quilts all her life, but, sadly, I was not smart enough to learn from her. I do almost every other kind of needlework, though. If I could choose the kind of needlework to be featured on a calendar, it would be Hardanger, a Norwegian form of cut-work. Not only is it beautiful, but it is functional as well. In talking to the people at my local needlework store, (the only one in town, by the way!) I have learned that fewer and fewer people are taking classes to learn this beautiful skill. A calendar would raise awareness of Hardanger’s beauty and perhaps spark a resurgence in interest. Thank you for your newsletters and for this chance to win a stunning calendar! This is a truly stunning calendar with enough inspiration to last a year. The designs and colors used are a joy to look at. I would be proud and grateful to be the winner of your giveaway. Thank you for offering it. Gorgeous needlework of all types inspires me as I get bored with doing only one or two techniques and want to try them all – in other words, I would love a needlework “buffet” calendar. Mary, your blog is exquisite and a joyful diversity of topics make it so. A calendar featuring monthly techniques to practice would be great fun. That said, I’m fond of drawn work, whitework, cut work, and Ruskin lace. Yummy calendar! Needlework technique? – embellishing hand applique with stitches. Whether it’s fine work or folk art, all is wonderful. Thanks for the chance to win! Would love to give this calendar to my mother who is an avid quilter. It would be great to have calendars on white work, blackwork and Goldsboro. I love William Morris style. Have both of the quilt books featuring Wm Morris style. I have made that Wm Morris baby quilt for my granddaughter last year in more pastel colors. Would love to have this calendar. I would love to have a calendar including needleturned applique. Very much enjoy your blog. I think Jacobean embroidery and crewel work would be high on my list. [However, I have a fascination with quilts, hence entering this competition, and visited the V&A Quilt exhibition a couple of years – much to the merriment of my (adult) twin daughters who than became intrigued with the historical side of the quilts when they accompanied me! I’m also fascinated by William Morris and the Arts and Crafts movement. In fact, I’m fascinated by all embroidery and sewing techniques! Thank you for your inspirational emails and website. Love the calendar! It would be very inspiring to see it everyday! In my calendar, I would love to see more on embroidering letters freehand. I love to embroider sayings, but spend countless hours ripping out and redoing, especially cursive because I just can’t seem to get it right the first or tenth time! It’s awfully hard to choose just one technique to showcase when there are so many gorgeous types of needlework. This year, however, I think I’d choose drawn thread work. Hardanger, hemstitching, needle darning and all the others would make a lovely calendar. It would be even better if each was a small project with directions. Dear Mary, My most favorite method of handwork is applique and this calendar is very exciting. What an inspiration it would be for me! Hi Mary, I have always loved William Morris prints and the arts and crafts movement. Thanks for the chance to win this lovely calendar. Although my first thought to answer the question was “whitework” on reconsideration I would choose something more colourful … so CREWEL! I’d like to see a calendar with tatting (completed projects and/or patterns) because I like to tat but need a push to pick it up again, or (even better, but less likely because even fewer people do it) bobbin lace, which is my Next Big Ambition to learn. I’d love to have this calendar too, tho, because I’m about half-finished with my first quilt, a scrap-based Six-pointed Star, and of course am looking for the next pattern . . . but now I want something unusual, not something out of a mass-market magazine. Yes, I am a design snob! I love all kinds of needlework, though I only do a few, but I love to look at all kinds. It’s really nice to see big, clear pictures that inspire me with their colors and designs! I would LOVE to see hand embroidery with mixed media. There is so much that can be done with a needle and thread and this form of art really inspires me. Hi Mary – thanks for the opportunity to win this magnificent calendar. Calendars for me are so important – our whole family use the same one so that everyone knows where everyone is at any given time – its great for teenagers!! My idea of different pages for each month with different techniques in embroidery would be ideal – this would inspire me to have a go at any new techniques I may not have already tried. A calender creates inspiration! Dear Mary, My very favorite type of handwork is applique. What an inspiration this calendar would be! I would love to see a calendar with the stump work technique on each of the 12 months. A variety of levels of difficulty and designs to inspire even the most begginner embroiderer. THE NEEDLEWORK TECHNIQUE THAT I WOULD LOVE TO SEE FEATUED IN A 12 MONTH CALENDAR IS THE “BULLION STITCH”. Thank you, Mary, for another wonderful give-away! I would really enjoy a calendar with Elizabethan Embroidery featured every month. P.S. Today we finished the first day of “Embroidery Heaven” with Susan O’Connor, in Beacon, NY [which I learned about from YOU!]. It is HEAVENLY! I would love to see any kind of drawn thread work, like hardanger in a calendar–it’s so pretty. And thank you for offering this beautiful calendar as well! William Morris is one of my favorite artists. I would love to see a different embroidery technique each month with time to practice before I moved on. I’d also love to see a crewel calendar. I love to do embroidery on my quilts the color of threads I use really accent the quilt it self and the quilt is a one of a kind. Embroidery brings out the classiness of your piece of art! The William Morris calendar provides inspiration for every month of 2013. One of my goals for 2013 is to start creating applique combined with hand embroidery patterns for my own use. This calendar would be perfect for ideas and inspiration. Gorgeous! Whoa! What a pretty calendar. I’d love to have 12 months of stumpwork. Thanks for the chance to win Mary! An ideal calender for me would have 17th century English samplers on every page…with maybe a few 18th century Scottish thrown in for good measure! I would love to see some 18th century crewel work with wool to be showcased. For example, what was done on bed hangings and bed covers. I would love to see beautiful hand embroidery every day of the year! Simple outline stitch, satin stitch, cross stitch. Any and all kinds of stitches. Oh, and to look at beautiful thread in an embroidery…. Ah, joy and bliss! I would love to see a calendar depicting the origins of needlework by country.I’m sure each claims to have created a particular type or method of needlework.Inspiration to try my hand at something new or well loved would be handy on my sewing room wall.Thanks again Mary,my fingers are crossed again. Judy-In-Frenchtown. I would love to have a calander features older techniques that we don’t generally use today. I think that looking at somehting like that every day would inspire me to find the time to have a go. If I could pick a technique to have a 12-month calendar about, it would be goldwork… is that just one technique??? (LOL) It’s SO lovely to look at, and the craftsmanship of it is amazing! Thank you for all your posts about it – I love to see your work and the historical pieces too! If it has to be just one needlework technique … that would be whitework. But I love to look a stunningly beautiful pieces of all sorts. The William Morris Calendar is really beautiful. What an inspirational reminder to put some needlework into each day of every month of the year. Thank you for the give away. If I could have any technique featured, I think I would like to see more on transferring patterns and the french knot. Some of my knots are just perfect, but others are not, and I would love to learn to do them better. I’d love to see some of the rarely seen embroidery techniques and stitches from around the world. I’d love to see the unique stitches used in places like Morocco, Peru, Indonesia, India, the Inuit nations and Korea…places and stitches that don’t always get the top billing. Of course, I’d want to see the backs of the pieces and diagrams for the stitching as well! heads up on this calendar – will have to purchase if I do not win. Thank you for this awesome giveaway – Morris style is really breathtaking. Clones lace or Tambour would be gorgeous. I would love to see stumpwork as an illustration on a calender. Love your newsletters – they are inspiring me to pick up my needle again. A calendar with 12 months of any needlework technique? How about a delicious smorgasbord of different tantalizing techniques (Goldwork, Montmellick, Hardanger etc. ), each month displaying a sumptuous sample of both an antique and modern representation? What a tempting feast that would be! I would pick stumpwork (with goldwork included of course). There is nothing you can’t do and it is just so rewarding, satisfying and fun! William Morris applique is my absolute favorite thing. I have so many Morris fabrics and applique patterns. Michele Hill’s designs are amazing. I think applique would be my favorite for a calendar! Next would be embroidery and it would be a very close second. If I could have one needle technique of my choosing represented for 12 months on a wall calender, it would be gold work. As for the calender in this giveaway, well, I have a couple of Michelle Hill’s books and have been collecting fabrics to make a quilt I have in mind that I dream on sometimes. Wouldn’t it be lovely to have a calender on my wall to inspire me further? Mary, thanks for the opportunity to win this calender. You have the most excellent giveaways. You are a daily source of inspiration for me. You give me courage to try new things. Thanks for all you do. If I could have any needlework technique featured on a calendar, it would be all of them! Let me explain. Your discoveries and commentaries about antique pieces are totally inspirational. I have been fascinated reading how you put your detective skills to use to ascertain how a piece was made, what it was used for, how it can be preserved. So I would love a calendar to show a different type of needlework each month, an example of that technique, its history and what is being done to keep it worthy of our interest. Such a compendium of different types, examples and conservation techniques would make the calendar a keepsake for future reference. Looks like a beautiful calendar, and I would like to be considered for the contest! If I would design a single theme calendar I would have a tough time choosing between Blackwork (in it’s myriad current forms) and contemporary Whitework, which is just blossoming with potential in the hands of artists these days. So the decision would have to come down to which would be easier to photograph, and therefore my answer is Blackwork. There is just so much potential! I would love to see different styles of log cabin quilting featured over twelve months of a calendar. Since I just saw a display of beautiful Hardanger, that is what I would like to see demonstrated in a calendar! I would love to see this kind of calendar with a step by step of its designs that I could try my hand at for every month. That is the most beautiful calendar! I know that I will never do an applique quilt so I would LOVE to have a calendar to look at and dream. Maybe it will inspire me to at least attempt applique!!! Applique quilting has to be my favorite and I choose it as the topic of a calendar. The editing will be a problem because there are sooo many beautiful appliqued quilts out there. William Morris has a style which has appealed to me since I first started embroidery and couture garment sewing. Thee are so many ideas with each page. So, what would be my needlework technique? Embroidery focusing on long and short stitch in a variety of fibers and styles. The possibilities are limitless! Thanks Mary for your blog. I enjoy it each morning with my cup of tea. The photos of this calendar make me wish for some larger pictures. Not that I am in need of more projects, but this calendar looks like something I could drool over every month and glean more inspiration for future projects. Hi Mary, WOW what a great prize. William Morris is a favourite. I would like to see needleturn and embroidery combined into a beautiful quilt and featured on a calendar. How good would that be. I would say embroidery, used in many different ways, not just wall art. It can be used on quilts, clothing, even children’s toys, things like umbrellas, pet gear (collars), upholstery (slipcovers – and I’ve seen gorgeous sofas and chairs covered w/ hand embroidered fabric. I have even seen CDs that have been embroidered. pretty broad-ranging fiber art, I’d say! I would love to master the plaited braid stitch! I love the colors used in the September sample. I’m going to try it with some of the silk threads I have ordered! PS I love William Morris 🙂 I have a beautiful quilt book with some of his inspirations. would love to see a variety of needle work skills. I’m open to the old ways as well as the new methods of creating a beautiful finish to my projects. Thank you for having this opportunity. I love William Morris and first learned about him in library school in the course “History of Books and Libraries”. I discovered his Kelmscott Press that was devoted to printing books that resembled incunabula or early printed books and the wood-block cuts that illustrated them. Morris designed the type and books, but I later discovered that he was much more than a book designer. He was a major part of the English Arts & Crafts Movement of the 19th c., a painter, poet, textile designer and I just love his designs. So thank you for the opportunity to enter this give-away, but more than that, mahalo nui loa for your web site! I learn so much from your instructions, especially from your video tutorials. My mother first interested me in embroidery when I was very young, a gift to me of her Greek heritage. I recently took it up again, and since I no longer have my mom, it helps to have you as a resource. Thanks again! I have been drooling over the William Morris applique book for awhile, but haven’t bought it yet,so I would love to have the calendar to enjoy for a full year. what a beautiful calendar. i use mine not only for appointments but for memories…first words, steps et al. i would love to see twelve months of beautiful hand embroidery stitches on all manners of fabrics. thank you for the opportunity to own this treasure. I am new to embroidery and would love to see embroidery instructions for accessories. Thsnk you for this wonderful prize. I would like to see smaller, but beautiful things that could be sewn for gifts. Not quick crafty ideas, but things that will stand the change of fads over the years. I love quilts but I can’t make 12 quilts in a year. I just found your site while looking for things to make for a grandchild who is getting married. I love it. Ideally, I would love to see a different technique every month! But if I had to choose one, regular embroidery, with it’s wide variety of stitches, would be great with a different stitch explored in depth every month. Thanks, Mary and Country Bumpkin! I enjoy all of the embroidery techniques, but my favorite go-to or ‘always-go-back-to’ is Jacobean embroidery. I started out doing the Jacobean crewel embroidery decades ago, but I much prefer the finer threads and array of colors available today. The designs are similar in style, but yet so varied in pattern. You can use many different stitches to complete a project, especially fill-in areas. Jacobean never gets old or boring to me and the end results are spectacular. Gold work. I loved your posts on gold work and pearl purl and all that good stuff. Then again, I like everything you do. The idea of each month featuring a new technique. And as William Morris goes, its me. I have her books and have made one of her quilts along with a collection of William Morris inspired fabrics. It is a hard choice but I guess my first choice would be silk ribbon embroidery, My second choice would be brazillian embroidery. William Morris designs are timeless, inspiring me in my needlework and quilting! I’d love to see the stitches found on crazy quilts explored in depth over 12 months. There are more than twelve to choose from! Thank You. Today, our first family pet died. I weep over the loss while consoling my young son, however, take comfort in the healing process that creation with fibers provides. Fluffy’s favorite place to play was a pocket, so we made a flapped pocket for Fluffy to rest in. With all of that said, I would create a calendar of silk ribbon embroidery. The raw fibers themselves are so exquisite. For me, on this day, they remind me of a flowing, healing rainbow connecting us to nature. Creating embroidered images with natural fibers enables one to ‘paint’ with expression on a blank canvas, translating emotion through the push and pull of a needle. May all of our furry friends who dared to play amongst or yarns and threads be forever a part of our love and our lives. Walk that silken rainbow Fluffy into Gods arms. Wait for us on the other side of the rainbow. God speed. May I send you deep sympathy for the lose of your beloved Fluffy!!! Over our 44 years of marriage , we have lost many,of our beloved and cherished “furry friends!”. It never is easier as each one shares a special place in our lives and hearts…may you have peace in knowing that Fluffy is in a restful place with all of our fellow pets!!!! I hope you have read Rainbow Bridge!!! What a terrific calendar. I quilt but nothing like that applique. I’m a fairly new reader and have already learned so much from you. Ooh – a whole year of superb needlepoint, from traditional wool exquisite basketweave to embellished, jazzed-up painted canvas work for me! I love William Morris, was lucky to visit his house in Walthamstow, in London. Quite frankly I would love anything with his designs, but if I had to choose I would go for embroidery. Thank you for the chance to win this beautiful calendar. I have two books on William Morris’ Aplique. They are stunning. I would love to hang a calendar with Thread Painting up on my sewing room wall. I would love to have a calendar on needleturn applique. Especially William Morris. I just love what Michele Hill has done with his patterns. I have purchased the quilt book she authored and hope to start working on some of the patterns. A calendar to remind me of the most beautiful applique, on a daily basis, would be a fantastic year of 2013. Hi Mary! Beautiful calendar! If I could feature any needlework, I would probably have a different one each month. After all, how can you pick one out of all the wonderful things out there? So you could have: embroidery, surface embroidery, crewel, needlepoint, hardanger, Schwalm, redwork, blackwork, huck weaving,tatting, applique, tapestry, bead embroidery, cross stitch, needlepunch, ….oops I think that is too many months! The technique that I would like to see featured is applique because that is my favorite quilting technique. And the William Morris designs are beautiful. This is William Morris at his best! I do have plenty of patchwork fabric in a cupboard……..but spend most of my time embroidering! A calendar with a “Specialty Stitch of the month” would be a great idea (with simple directions on how stitches are formed). That way all of us would not be so nervous in attempting new specialty stitches. In fact, I’m sure you can make one easily from all your articles Mary, the Mary Corbet calendar!! Wow isn’t this calendar just amazing! I could just drool over these quilts every day of the year just imagining them displayed in my home. The kind of needlework that I would love to see in a calendar has to have lots of colour and texture in it or otherwise beautiful needlepainting which I absolutely adore. It doesn’t really matter as long as I am totally inspired each and every day just by looking at my calendar. I would like to see a calendar on embroidery and appliqué of course. Thank you for giving me a chance on such treasure. A nice calendar, that’s true, can delight a day and it is wonderful being inspired by something you see at it. I especially like art calendars, flower bouquet calendars and food calendars with recipes. Since we are all more or less conditioned by the time something has to remind us that there has to be a leisure time for making something precious for our minds and our souls. If I could choose a needle work technique to be featured over 12 months I would decide for Stumpwork. admiration in me because I know how much work it is and how much creativity is necessary for it. P.S. Please leave me out of the raffle for the give-away calendar since I live in Germany. It was a pleasure for me that I have here the opportunity of saying something about Stumpwork! Looking daily at something William Morris would be nearly a devotional start to the day. There is something so calming and restorative to his designs. Of course, reading you blog has the same affect on me. The quality of you work and the beauty of your photographs have me nearly at your side. I find it very pleasing to look at and read besides learning so much from the information you share. Once again thank you for your generousity in another give away. I just love William Morris but if I had to choose an embroidery technique for a yearly calendar I would choose Crewel. A year full of beautiful different types of Crewel embroidery would be heavenly. I would love to see a calendar on needlepainting, of cute fluffy birds. Just like the ones Trish Burr does. That would be amazing! Thanks for the chance to win such great eye candy. If I could see a stitching technique on a calendar I really would have difficulty choosing just one. I could reduce it to two – Whitework and Stump work – but I think I would go for Stump work because it is something that has always fascinated me but I have never had time to learn it. I could learn a new part every month and then put it all together at the end of the year. What a great idea! I would love to see hand embellishment of pieced wool table runners or toppers using embroidery stitches. I just took a class with wool, and what makes the project look beautiful is all the hand embroidery and beading that gets added after the piecing is done. I love the William Morris fabrics. I have some from several years back. I hate to use up the ends and only put this fabric in my favorite quilts. This calendar looks so inspiring. Thank you for your daily inspirations to all of us. I would love a calendar of embroidered vestments (appropriate to the month, perhaps!). That is a hard one. I love anything that requires a needle, but I guess it would have to be counted thread work, especially hardanger. It is the most beautiful and challenging thing I have ever tried. I have a friend that loves William Morris, and this would make a perfect Christmas gift for her. Thank you for the opportunity. I love appliqué and William Morris, so this is the perfect calendar!!! I would choose Goldwork, simply because it is so beautiful and I would love to learn to do it someday. Whitework is a close second though! I have loved William Morris’ work since I first met it in an Art History class at university. I have all of Beth Russell’s William Morris needlepoint books and several projects are in my “to do” project list. I dream of a complete set of dining room chairs covered in Morris needlepointed patterns. This calendar would give me pleasure for years to come. Thanks for the opportunity to win one! Oh to answer question 2: Needlepoint and petit point. Altho’ I follow daily your newsletter and all the applique and embroidery that you give us, my wish in the calendar of the future would be to have a different applique technique to look at for each month of that year. What a treat that would be! Thank you, Mary, for your love of sharing, teaching, and all that you give of your time. mary, i have been lurking since the gold medallion project. you are a rock star! but i knew that right away with your name and state heritage ( i live in overland park). i am crazy about anything old…especially folk art and anything williamsburg…so i’m no fun to shop with…i drive right past crate and barrel and pottery barn…and none of my friends truly appreciate my brunschwig and fils fabric. oh well, i’m used to it. i have other redeeming qualities which they appreciate about me (sewmuchfun). i am a quilter, and when my talent finally takes an upward turn, will someday make a william and morris quilt. the calendar would be the perfect inspiration! in the meantime, i love all easy hand embroidery projects, and enjoy learning new stitches. keep up the amazing work…i am completely in awe of your expertise and talent. I would love to have this calendar! I love quilting and wish I had more time to do it. I also love embroidery and am sooo happy that a friend introduced me to you! I love my Inspirations magazine from Australia and this calendar would look fabulous in my studio. I would love to see a calendar of stumpwork pieces. I took a class in San Diego from Jane Nicholas when she came to the US this year and am so amazed at the process and final outcome. Wouldn’t a stumpwork calendar be gorgeous? I teach embroidery to children during my Ohlone Art Camp. Visit my page: http://www.facebook.com/ohloneartcamp and see some of the amazing art my kids do!! If I could have a calendar only with one type of stitch it would be blackwork. I normally do crossstich but recently I got very interested in Blackwork and would love to see what people have done with the patterns. Goldwork would make a beautiful calendar. I am not experienced with the technique but admire the pieces you and others have done. The quilted calendar is beautiful and would make a great gift for a semi-professional quilting friend. This is my first day following the site and I love that the William Morris calendar is featured. The designs are timeless and make me want to try my hand at this art form. Would love to see some of the designs in needlepoint, my favorite form of needlework. This is my first day reading the daily posts. I love the William Morris calendar and would love to see some of these designs turned into needlepoint, my favorite type of needlework. 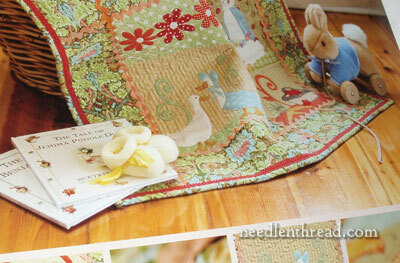 If I could have twelve months of hemstitching illustrated on a calendar, it would be wonderful! There are so many different ways to make hemstitching beautiful. I seem to be familiar with only a few. I have a very old book on stitching that talks about hemstitching but it only uses drawings instead of actual pieces of embroidery. wouldn’t that be fun to create? Twelve months of different hemstitches? It is invigorating to see how many people are passionate about W. Morris. I love the thread painting of Trish Burr and Young Yang Chung and would love to see them in a calendar. Another clever idea, your passion for embroidery and teaching is wonderful! I enjoy your A-Z guide for ideas, how about a calendar that provides stitch examples applicable to the months of the year. For example, satin leaf stitches representing a pattern for the Fall months…pretty and useful! Continue to keep us inspired by your great ideas! I would most like to see goldwork on a calendar . I like to see all the glitter and the pictures are so delicious. I would love to aspire to the expertise of these embroiderers, but will have to just admire the amazing techniques and beautiful results that result from the hours of work put into these works. I love quilts and this calender looks awesome! And since this is such a quilt inspired giveaway, I would love to learn more about crazy quilting. Something I’ve long had a interest in and would love to accomplish one day! I love surface stitchery in all its manifestations from old Schwalm work to garden vistas and needle painted flowers and birds. What a wonderful calendar it would be. Thank you for offering such a beautiful calender! In a calender, I think I would like to see each month displaying a technique or sample of embroidery from different countries or cultures. I just love William Morris designs, particularily the florals in his wallpaper designs, and since I love floral and jacobean designs. I would have to say if I could have a calendar made up just for me I would love to have it show pictures of embroidery done up in the jacobean technique of florals, trees, etc. I just find them so fascinating to look at. I have several books showing jacobean works of art and pull out the books often for my personal perusing, it would be nice to have a different picture every month hanging on wall where I could see it any time I walked into a room. Thanks for asking. when I heard give away I thought ‘cool’. I had to think about this one and I came up with this idea. Each month would feature a new techique, e.g. Montmellick, Portuguese Whitework, Schwalm, drawn thread work (antique hemming, etc)that could be made into a small item (doily or table runner) but also, each month could be worked on 1 larger piece of evenweave and the entire calendar could be your very own SAL or sampler of techniques. Marian, I think your idea is super. “Schwalm” was unfamiliar to me so I looked for examples……and LOVE it. Small monthly projects would get me working, not just admiring. I would ADORE getting this calendar! Quilts would be definitely one of my top 2 choices of needlework to hang in my sewing/craft room; the other would be crazy quilting: the embroidery and beadwork are fascinating and inspiring! I would love to see a calendar done in different types of Hardanger. I hope this would help to make it more popular. I do lots of embroidery for myself and my family. I would love a calender featuring embroidery. Especially the sweet vintage tableclothes and tea towels. I have done an embroidered bed skirt and many pillowcases. A calender with something along these lines would be delightful. I would love to see a calendar of English Embroidery from the 16th and 17th centuries – especially the embroidered jackets, coifs and gloves, basically because I never tire of looking at it and I want more needleworkers to know how amazing and gorgeous it is. The designs, colors, materials used, workmanship and overall effect is very special. And there’s bobbin and needle lace on these garments too (another fave). Thanks for a fun give-away! Morris and his friends have long been on my much-admired list, and no wonder really. I am into embroidery, print-making, textile and general design, architecture and interior design, all of which he had also had an interest in as well as working in many of those fields. I also feel an affinity for the women he encouraged to work with and for him. I also try to live by his much quoted maxim: have nothing in your houses that you don’t believe to be beautiful or useful. So the bottom line is I would love to win one of these calenders, not only because of Morris’s designs but also because Michele Hill seems to have captured much of the Morris ethic. Thank you Mary, for the opportunity. The quilts were almost unrecognizable to me as William Morris designs. I’m not sure why – maybe because they are stylized versions of the work. I’d love to see a calendar of Quaker sampler designs with stitching charts! My vote is split: Either feature Hand Applique in its myriad of techniques, or Pulled Work, which sometimes straddles Heirloom. I’d love to win the calendar because I’m so devoted to WM! and grateful to you for the chance! The technique I would like to see on a calendar is couching. It woujld be wonderful to win the calendar! If it had to be ONE technique, then obviously (I always go back to this) it would be CQ! Reason: the variety it incorporates to make the 12 months different and interesting and inspiring and bright and ….. on and on! For me an ideal calendar would illustrate any counted technique! I would ask for a calendar showing a different type of needlework/technique for every month, plus one for the cover. The problem there would be picking just 13 different types of embroidery and then picking just the right photo for each page. Janet. applique’ on each month. William Morris is a legend – add some embroidery and embellishments to the needle turn and you have a family heirloom for generations to com. I LOVE to make things for my grandchildren so toy making would be fun! OR pajamas of different kinds! I just love to sew and quilt so anything fun and different would be great…. Any needlework technique featured over 12 months in a calendar would be redwork. I am a newbie at it. There are so many places to go with this technique. I always get confused about the type of stitching to do for this. Yep, redwork! So beautiful and delicate. What a wonderful prize! I would like a calendar with a different hand embroidery technique to try each month. Or, feature an embroidery technique from areas around the world or through history. Thank you for organising a giveaway – I’ll try my luck ! To date I have only learned the Australian smocking and have many of the books from Country Bumpkin. I have done machine embroidery and the smocking on the embroidery machine and am just getting into trying quilting. I am really excited about finally having the time to learn many more techniques that I have seen on the Country Bumpkin website. I have a number of the Inspiration magazines with beautiful projects just waiting for me to try. Therefor I cannot tell which technique I would like to see on the callendar except that I think a variety would be nice. The inspiration one would get from seeing such beauty on a daily bases cannot be measured. Thankyou for the opportunity to have this. I would like to see a different technique each month. Applique, bargello, needle lace, Cutwork, Berlin Embroidery, tapestry, cross stitch, running stitch (quilting), crewel, chicken scratch, turkey work, and thread painting with directions for all of it on the back so I could practice it all year long. A stitch a month with several patterns to try would be delightful! Thank you Mary for continuing to share these wonderful offers from needlework shops all over the world! The William Morris’ calendar is a work of art. Turning the page each month is like receiving a gift and being able to savour it for 30 days. My quilts are white on white, all designed by hand with a water soluble pen, then hand quilted. I would like to see some forms of embelishments mixed with stump work. I do use ribbons, old lace and antique buttons on my baby quilts and people love them. I find the whole process quite relaxing from beginning to end. Thank you for publishing such extraordinary and high quality magazine called Inspirations. Cool give-away. I’d be happy with a wall calendar devoted to obscure surface stitches. Not a specific style but rather techniques you just don’t see every day or even every month. Hmmmm, If I really had to choose for twelve months of what I would love to see on my calander pages, I think it would have to be the beautiful Crewel work. I haven’t mastered it, but do admire it. I am loving the Needle and Thread website. The videos and photos are awesome and informative. I am using this site to educate myself and increase my stitch repertoire and my stitching skills. Love the Arts and Crafts period. His wallpaper and fabric designs are gorgeous. Can’t wait to see the quilting patterns built from these. I would love to see any technique — a different one every month would make me happy, but if I had to pick one, it would probably be stumpwork because of the many variations there could be. I would love to have the Morris calendar hanging in my kitchen for the next year. I would dearly love a calendar that featured some gold work projects that are not too large or complex. I love Michelle Hill’s contemporary interpretation of William Morris’ designs. They are stunning to look at and so inspirational. These photographs look fabulous. I would love to see examples of more beautiful applique with tips on techniques to achieve a good finish. Maybe some embroidery combined with the applique too. I like both hand and machine applique and pieced patchwork using the latest ranges of fabric. Although looking at William Morris applique would be pretty fabulous, too! I do not have a single picture decorating my sewing room, what a good idea to have a beautiful calendar hanging up perhaps with Jacobean designs on each page in 2014 then I could admire or aspire to make a different one each month. Such a lovely calendar and so inspiring! I would love to have my name drawn from the “hat”! Such a generous offer! Who wouldn’t love one of these gorgeous calendars!!! I know that if I win, it will live on the wall next to my computer to provide beauty and inspiration many times each day. I’d love a calendar that featured an embroidered thing that correlated to the month/holiday/season. if I had to just pick one though, it would be hardanger or whitework or something equally elegant and lace-like. Thanks for the reminder; I would love that calendar. I would love a calendar with gorgeous surface embroidery on it for every month, like your Medallion project. Ideally it would have small process pictures somewhere in the same month so you could see each one being made every month. Yummy! Mary you have the most wonderful give-aways. I like theme calanders. What I would like to see would be projects with different counted threads on different fabric. There are so many of them and this would inspire me to try more of them. Goldwork or needlepainting — or both together! I love colorful calendars and couldn’t imagine a house without them for notes of upcoming events, etc. Applique quilting is my favorite form of needlework and old crazy quilts have some beautiful needlework on them. I love William Morris designs and this calendar would fit right in my sewing room. I suppose that we should enjoy them now because they will probably become passe as the newspaper and books. Sigh! I want to try stumpwork with needle-lace and specialized embroidery techniques to make 3-D objects. What a lovely calendar! I, too, love calendars, I need one in my sewing room, and at least two at work (so I can see two months at a time). I also look for just the right one that I will love looking at all through the year. I would love a calendar to focus on surface embroidery, or one on goldwork, or heirloom sewing, etc., etc., etc. (as the king said). There are so many different techniques to do applique, and I’m an expert in none. I would love to see a 12 month calendar demonstrating various applique techniques, when and how they are best used, and an explanation of any special tricks of the trade to make a beautiful final applique design. Thanks for the chance to win that lovely calendar…something to drool over for 365 days. I would love a calendar with Antique Samplers featured in cross stitch and embroidery. I am excited about the history of needlework and would love to learn more! I would love to see more gold work. You do such beautiful work, I appreciate it, but have not yet decided to take the plunge into doing some myself. Thanks for this opportunity. A couple of years ago I was fortunate enough to tour two properties near London that are connected to William Morris. His designs are timeless!! I would love to see a calendar featuring crewel embroidery. I love the look and texture of it, but don’t do it very well. Maybe I should spend a little more time trying to perfect my technique; however, I would rather do needlepoint and beading. I thought about this for a long time and I could never choose between all my favorite needlework techniques, so I broke the rules and instead settled on a subject matter: flowers. Then each month, the person could have a different needlework technique. I am imagining Jacobean flowers embroidered in wool for November and redwork roses (in honor of Valentine’s Day) for February. Perhaps there could be cross-stitch mistletoe or holly for December? I would love a calendar on needle lace. You don’t see much about it and it would be fun! Thanks sooo much for the opportunity to win the calendar. I LOVE Wm. Morris’s patterns!!! Hand applique is my passion – especially if it is done with embroidery for accents and dimension!!! I am new to crewel, and would love to see 12 months of beautiful designs! I love all things Morris and Arts and Crafts, so would love to win this calendar. I would love to see a twelve month calendar devoted to Surface Embroidery in all of its lovely manifestations. Surface Embroidery covers a huge amount of ground all over the world and includes not only the lovely English embroideries I was trained on but Mountmellic, Kantha, Yugoslavian, goldwork, surface lacework…just tons. Even better I would like to see an embroidery stitch a day calendar with perhaps each month have a theme of related stitches or techniques. Wonderful. Thank you as always Mary for your brilliant site, hard work and dedication. Oh what a beautiful calender. I can see it hanging in my re vamped sewing room, reminding me to sit awhile longer and sew, to do all the sewing I dream of. I would like to see a calender with Schwalm and Whitework. I have completed a sampler tablecloth with Schwalm and Whitework and now can see how nice it would be on a calender. What a beautiful calendar. I would love to see a calendar with some different techniques each month showing a quilt block and each of the various ways each months’ block could be created. This way we could decide how each block would be completed; maybe one month I’d feel like doing hand embroidery, the next month applique, or maybe crazy quilting. But at the end of the year no matter which way I chose to create each block, they would all still ‘fit’ with one another because they were all within the same theme. I hope that makes sense. How exciting. I just bought the Michele Hill book yesterday and am enjoying the photograghs in it. I would like a calendar of goldwork embroidery. I would like to learn this technique and some project/stitch to work on for each month of the year with photograph of the finished item would be a really great learning tool. Also a list of required items for each project. Yes- that is what I would like. Hi Mary ~ What perfect timing – I am looking for a nice calendar for my office, this would be lovely. What would be my choice for a calendar ~ Brazilian Embroidery, of course. May I have a second choice ? It would be a Trish Burr calendar ! Maybe we should suggest that to her. I am going to keep my fingers crossed to win this calendar in the mean time, until Trish does one. So glad another embroidery told me about your website TODAY! I’m having such fun checking it out. Couching/Laidwork would make a great calendar with all the different threads out there. A calender of detached buttonhole, variations like trellis, circular stitches, bullion, and slips would be delightful for a year long learning process. William Morris has designs like no one else. I would love a calendar with a different embroidery stitch each month which would be a part of a sampler that would be finished in December! Of course the sampler would be modern and colorful! I’d like to have a calendar featuring hand embroidery techniques for creating water, tree bark, sand, snow and other items found in nature. If I win the gorgeous calendar, it will go under the Christmas tree for my quilting sister ! What a beautiful calendar to win. How inspiring to have this hanging on my wall. I would love a calendar with hand embroidery with some useful handy hints or techniques each month. I feel this would inspire me and hopefully I would achieve much more each year. I WOULD LOVE A CALENDAR WITH SIMPLE STITCHES FILLED WITH RICH COLORS USING DIFFERENT TEXTURES AND ALSO 3-DIMENSIONAL THAT CAN BE FRAMED PLEASE. LIVING IN SOUTH AFRICA WE ARE SOMEWHAT LIMITED AND I RELY ON WONDERFUL PEOPLE LIKE YOU. It would be lovely to win this calendar. William Morris designs have (lightly) followed my life from Liberty of London, my favorite (window-shopping) store when newly married, to our last English house with Morris wallpaper, to our current American house of English structure. Applique is something I aspire to, but the materials just laugh at my fingers. For a technique featured over 12 months in a calendar, it would be nice to have a series of stitches. Picture of a beautiful piece – line drawing picking out one of the stitches with brief how-to. Crewel embroidery would lend itself nicely to this. If “any” is not a valid answer, then I think I’d go for whitework, Goldwork, or needle-painting/long-and-short. I think those have great potential for calendar-sized, fascinating photographs that would be both beautiful, and inspiring. The thought of being able to look up & see whitework up close… mmmmm. Thank you for all your very hard work for this blog! Every day, I look forward for your site and enjoy every articles you are writing and love your patterns are well. I have a calendar who represents tea pots and cups and I have enjoyed these precious pictures every day but having on my wall a William Morris calendar would be all my cups of tea on one sheet! I love all hands embroideries but have a tendencies toward machine embroideries as sometime, time is limited but need to play with all my threads. I just have the time to dream when I look at your absolutely beautiful and perfect embroideries. I just made a battenburg lace bib (by hand) and embroidered some flowers spray in the center and used your embroiderie flowers that you were showing several weeks ago. I got 3rd place at a show and I am very proud of it. So thank you as you are also the winner as each time we all are creating something it is part of you that we transfert. So thank you for sharring your knowledge and please continue as we all enjoy your talent. William Morris is an inspiration to any one who loves creating beautiful thing and he lived just up the road from me! The air is full of his creativity (I am so lucky). Having his calender on my wall would be the the icing on the cake. The technique I would love to see on a calender would be blackwork as it challenging and stunning. What a wonderful calendar! It would be a wonderful inspiration for all the year. If I could choose one theme for a calendar I would like to see crewel embroidery, needle lace or whitework… Can I write three? It is so difficult to choose only one 🙂 But maybe crewel embroidery would be the best of these three, if someone would like more colours. What a wonderful giveaway. I love Michele’s beautiful quilts. I would like to see a calendar with different applique techniques. The pictures are so inviting. I love looking at them. If I could have a needlework calendar published I think I would want one with examples of lace making from around the world with the individual and their tools at work and an inset closeup of the piece, either as it is, will be or completed. I learned bobbin lac making from a young lady at the University Of New Mexico. She had learned from some ladies on an island off the coast of Brazil, I think. She had gone there during a summer between semesters at college and ended up staying there longer and learning lace making and Portuguese. As usual you find another way to inspire! And to covet!! If I were to design my own calendar – of needlework – it would have to be a sampler. A different technique for each month to inspire some more! A calender with applique work, completed with embroidery features and detached work for extra affect would be my choice. I love the William Morris fabrics and designs, so rich in colour, and so diverse in design. Next Next post: Dissecting Goldwork & Silk Embroidery – Gently!